American rock band founded in 1971 by Glenn Frey (guitar), Bernie Leadon (banjo, mandolin, electric guitar, acoustic guitar), Randy Meisner (bass) and Don Henley (drums). Their success says it all and it happened for a reason! The haters will spout off but, I think that they are just jealous! Yeah; You guys are 'so' Right-On! It's the world who has it wrong. 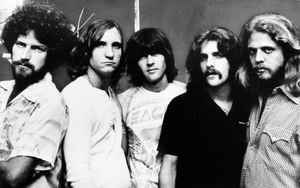 The Eagles are for me one of the most overplayed, overrated, boring highly successful acts in music history. For some reason their bland brand of country-infused rocks resonates with mass audiences. Bandmembers Glenn Frey, Don Henley, Randy Meisner, and others have released equally uninteresting material away from the band. The Eagles are really more of a product and a corporate marketing concept than they are a band. My recomendation is to avoid their music at all costs.